Disney could not have been happy that Sony beat them to the theaters with an Internet-themed animated film by 15 months. Dueling projects at rival studios is a recurring theme in Hollywood (in the ‘90s, it happened nearly once a year), and the winner is almost always the one to get to the box office first. Well, almost always. Sony’s Internet-themed film was “The Emoji Movie,” which owns a 3.2 IMDb rating and an 8%, um, freshness rating on Rotten Tomatoes. However, there are other rewards to getting to the box office first: even if the film isn’t a hit, the stench of failure can rub off on the film that follows, diminishing a rival’s box office by association. That’s the part that must have concerned Disney the most, especially with “The Nutcracker and the Four Realms” shaping up to be a massive disappointment and “Mary Poppins Returns” dropping on Christmas Day. The last thing Disney wants is for the two films that precede “Mary Poppins” to be duds. They can rest easy. 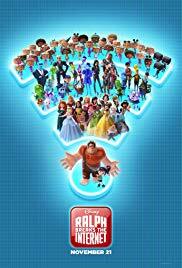 “Ralph Breaks the Internet” is a bit like “Deadpool 2” in that, while the element of surprise is lost, the film is far funnier than its predecessor, while moving the action to the Internet is a genius move in terms of comedic potential, not to mention youth engagement. The specter of “The Emoji Movie” still hovers around the edges of the film, but it’s more of a distraction than a flaw. Wreck-It Ralph (John C. Reilly) loves the routine of his life, playing his role as the villain in arcade game Fix-It Felix Jr. and then spending his down time with bestie Vanellope Von Schweetz (Sarah Silverman), the star driver in racing game Sugar Rush. Vanellope, however, is bored with the sameness of her game, so Ralph tries to surprise her with a new race track, which results in Sugar Rush’s steering wheel controller being broken by a player. In order to save the game, Ralph and Vanellope explore the Internet to find a replacement steering wheel, but while they’re there, Vanellope discovers a newer racing game that speaks more to her than Sugar Rush does, which leads Ralph to do unspeakable things in order to keep things the way they were. In addition to the life lessons the film teaches its young viewers (it’s all right if your friends have different interests than you), it also showcases some key do’s and don’ts of the Internet (watch out for the popup ads, and never read the comments). One part that could have gone horribly wrong is the scene where this Disney film visits the Disney online universe, in all its Princess/Muppets/Star Wars/Marvel glory. It reeks of self-promotion, but ultimately sets up two fantastic set pieces down the road, along with a barrage of good-natured jabs at Disney itself, so, yay? The Internet is represented visually as a place not unlike the spaceship in “WALL·E.” It’s big, bright, fast-paced, and extremely busy. Online users are represented by avatars with screen-shaped heads, which is a simple but nice touch. The voice talent is superb, though we’re reluctant to name names since it’s fun to figure them out. (Two hints, though: one is a recent Pixar vet, and another has become a Disney Animation staple for the last six or seven years.) Gal Gadot voices Shank, racing game ringleader and Vanellope’s new idol, but what makes her performance truly special is something else that we cannot discuss. Also, stay through the closing credits. There’s a can’t-miss stinger at the end. It’s not right that “The Emoji Movie” will occupy head space in viewers of “Ralph Breaks the Internet,” since the execution here exceeds “The Emoji Movie” in every possible way, but the phenomenon is real just the same. “Ralph” is better, but it wasn’t first. That shouldn’t matter, but it does, at least a little bit.